Our theme for this month is “May flowers.” We had three different stamp sets from which to choose, and for this hop I chose the Grateful Bunch stamp set and coordinating Blossom Bunch Punch. I have a daughter whose favorite color rotates between yellow and orange. She loves sunny, happy colors. And her name starts with a “K.” I found these fun wooden letters at a local big box store and decided to decorate one for her room. 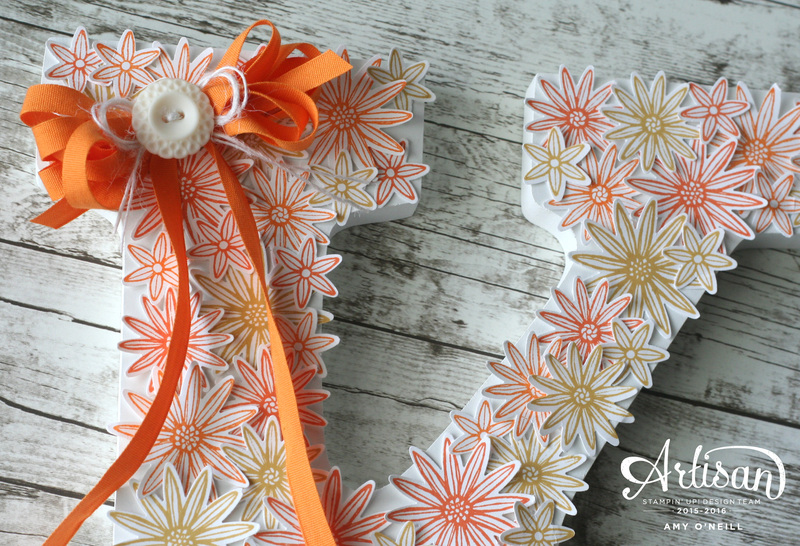 I stamped these fun flowers using Hello Honey, Tangelo Twist and Pumpkin Pie ink and punched them out using the coordinating punch. This is a project that looks like it would take a long time to create because there are so many flowers. But it really didn’t take that long because the stamp and punch make three flowers at a time. 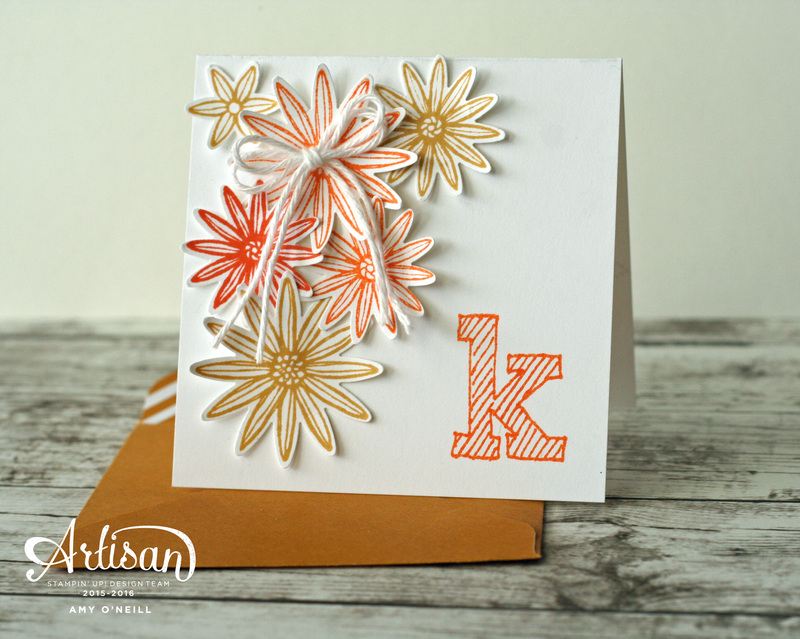 I just used glue dots to adhere all of the flowers to the monogram. I made a bow from the Pumpkin Pie 1/4″ Cotton Ribbon and a few strands of the White 1-1/4″ Jute Ribbon and a Very Vintage Designer Button. I had to get a little ribbon-tying lesson from fellow Artisan, Connie Collins. She ties beautiful bows and was so kind in giving me a quick lesson across the miles. Love her! This entry was posted in 3-d Items, Artisan Design Team, Grateful Bunch. Bookmark the permalink. I LOVE this!! Beautiful! 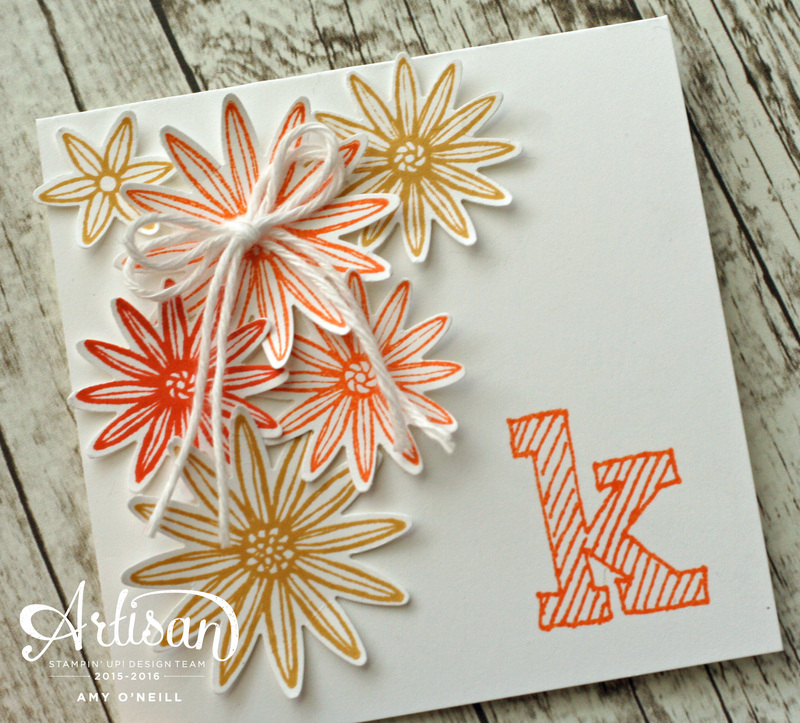 Did you color or cover the letter with anything before putting on the flowers? No, it came this way — it has a white finish. Even better! Everything I find is unfinished wood. Maybe I’m not looking in the right places. Wow! What a gorgeous decor project. So many pretty flowers Amy. 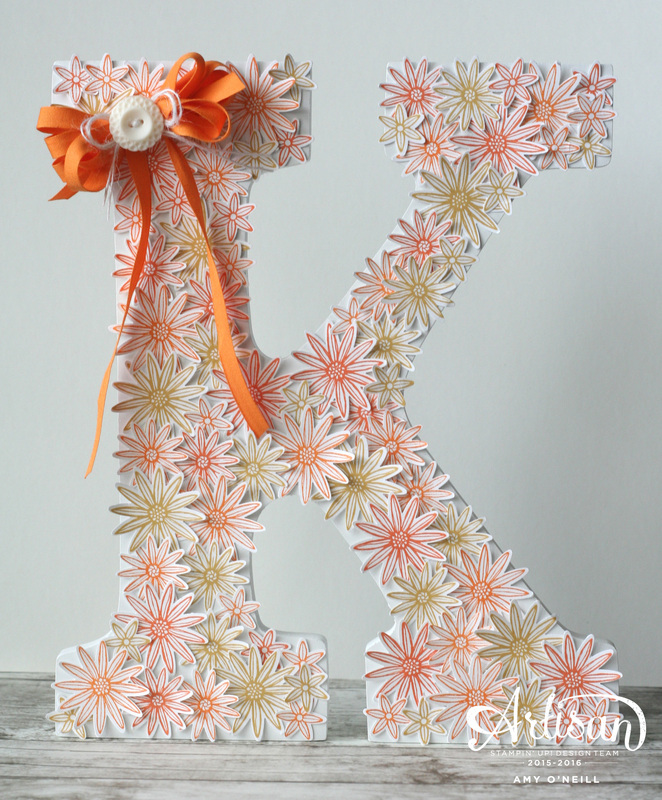 Love the big, flower-covered letter…I know you daughter will too! Great job with your bows…you are a quick study…looks like you really have it mastered! Hugs! Brilliant! And I totally know a “Connie bow” when I see one and you nailed it. Gorgeous work! beautiful!! but you already know that, as everyone thinks the same!! Have agreat sunny day! What a fabulous project!! I have two little nieces and I have now marked your project as a future gift for them!